BEHIND DOCKERSHill with a quick snap around the body, but it just goes through for a point. The Eagles chip it around the ground as they look at icing the clock, defending their lead. BEHIND DOCKERSde Boer kicks it around the corner and he just misses. Fatigue is starting to creep into the game as players from both teams start to become a bit more sloppy with the possession. GOAL DOCKERSWalters hangs behind the pack, as the ball spills into the goal square, he boots it off the ground for a Dockers goal. Tunbridge slams it onto the boot from 50m out, it bounces in to the goal square, but takes a turn for the worst as it bounces out of play. BEHIND DOCKERSDanyle Pearce takes it on the run, he releases it from outside 50 and it just drifts away at the final moment. The Eagles continue to dominate this contest, with the Dockers not offering much of a challenge. 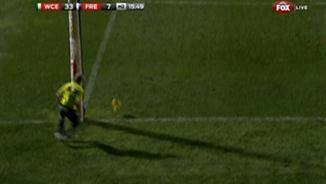 Interesting to see that the goal umpire was over ruled in that decision. BEHIND EAGLESMcGovern marks it 30m out on the boundary. He slots it through as the Eagles go ahead in leaps and bounds. It appears a review is in order and it is confirmed as a point. GOAL EAGLESMasten gathers the ball inside 50, he snaps for goal and it bounces through! The Eagles are up by 26 points. BEHIND DOCKERSThe ball is punched through for a Dockers rushed behind. Back in the middle for the start of the second half. The Eagles go into the break with a 21 point lead over the Dockers. 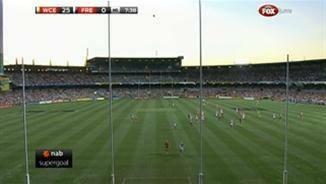 The Dockers are looking a lot better since getting their first score on the board. GOAL DOCKERSBalllantyne puts on the after burners, takes possession of the ball and connects with it before being dragged down by Brennan, but the ball had gone through for a goal. BEHIND EAGLESHams shot on goal is across the face and it sneaks through for a point. BEHIND EAGLESMcGovern snaps for goal from near the boundary line and he is off target. The Eagles are in complete control of this game, as the Dockers look a more fatigued outfit. SUPER GOAL EAGLESHurn marks 55m out from goal, he decides that he is going for the super goal and he kicks a long roost giving the Eagles a 25 point lead. The Eagles are dominating the play at the moment, not allowing the Dockers a shot a goal as yet. GOAL EAGLESMcGovern gathers the loose ball, snaps around his body and he stops the string of misses from the Eagles, by scoring a goal. BEHIND EAGLESThe ball comes off hands and through for a rushed behind for the Eagles. BEHIND EAGLESGaff decides to have his shot on goal and he is also offline. BEHIND EAGLESThe long bearded Masten has a running shot on goal and pulls it away to the left. BEHIND EAGLESCripps with a quick shot on goal and he is off target. GOAL EAGLESPriddis pings Johnson 40m from goal on a slight angle, he is rewarded with a free kick and he chalks up the first goal of the game. The ball is bounced in the middle of the ground and let the derby begin. We are set for the final game of the day, with a mini derby between the West Coast Eagles and the Fremantle Dockers. 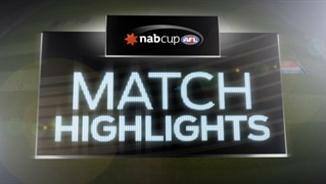 SHARROD Wellingham's career at West Coast has started without a glitch, with the Eagles cruising to a 24-point win over rivals Fremantle in the NAB Cup. In his first game since crossing to the club at the end of last year, the Collingwood premiership midfielder had eight disposals in the 1.4.7 (40) to 0.2.4 (16) win at Patersons Stadium on Saturday night. The Eagles capitalised on their dominance in the first half, holding a 21-point lead at the break. Fremantle were set to be held scoreless in the first half until forward Hayden Ballantyne got on the end of a pass in the 18th minute to kick his side's first goal. West Coast's intensity continued to be the main difference between the sides, a point reflected in the statistics. They finished leading the contested possessions tally 52-40, and also laid more tackles and won more clearances at the stoppages. Running defender Shannon Hurn was a standout, collecting 11 disposals and banging home a supergoal from inside the centre square to set the Eagles on their way in the first half. Scott Selwood was prominent with 10 disposals while veteran Andrew Embley had eight touches. With a number of key tall players missing, including Dean Cox, Josh Kennedy and Nic Naitanui, it was an opportunity for Eagles' back-up options to impress and Jeremy McGovern took the chance. The 195cm rookie was lively, booting a goal in the first half. He kicked another in the second half from a tough angle before a video review saw it overturned. Fremantle was served well by Paul Duffield (nine disposals), but lacked the spark and run it had shown in its win over Geelong. Young midfielder Jayden Pitt showed some encouraging signs with six disposals and Stephen Hill (seven disposals, three tackles) was sharp as the game wore on. West Coast coach John Worsfold: "It was a good intense hit-out to practice things against full-on opposition. Our skill level was not too bad. We missed a few easy shots at goal in the first quarter … and [we were] a little bit scrappy as well. Overall pretty good." 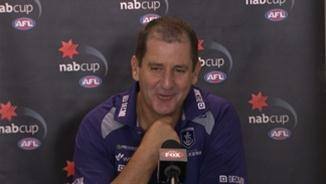 Fremantle coach Ross Lyon: "I thought Stephen Hill looked really up and about. [He] was probably our standout when he got the ball and he competed really well. Other than that I thought everyone else was pretty even." 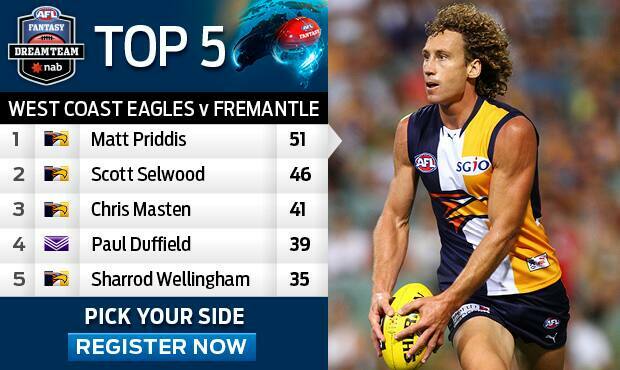 Because he doesn't have the style of some of his contemporaries, AFL Fantasy coaches often overlook the scoring ability of Eagles midfielder Matt Priddis (MID, $482,500). But it's time coaches took notice. As if his 93-point average last year wasn't enough evidence, Priddis picked up 51 AFL Fantasy points against Fremantle in an excellent outing.